A Mi-Voix is a large, vertically oriented, largely abstract painting. The elliptical surface of a table-top can be seen halfway down the canvas and three forms are vaguely discernible behind it, as though seated around the table. The heads of all three forms are made up of dark gestural lines, and the central figure has a dark body while the two that flank it are white. The area representing the head of the darker figure features the suggestion of a sinister smile, with a row of small white teeth. The forms appear fragmented, intersecting and merging with the patchy grey, brown and purplish-white background. The resulting effect is one of shimmering light and shade, captured in a way that is reminiscent of the opaque transience of smoke. There is a sense that the scene is only partially glimpsed, being an indistinct visual representation of the ‘whisper’ that is the translation of the painting’s title. This painting was made in oil on canvas by the American artist Dorothea Tanning in 1958, when she was living in France. To make it Tanning blended thinly applied shades of black and white to varying intensities. Dark lines were added to the patches of paint to demarcate the edges of the table and the vague outlines of the figures. The brown ground of the canvas is visible through the paint, adding a warmer tone in places and providing underlying colour to a largely black and white image. In January 1960 Tanning sent a letter to Tate stating that her approach to this work was to ‘paint a white and gray picture that would still have color in its veins as we have blood under our winter-white skin. And lots of unexpected light sources’ (quoted in Victoria Carruthers, ‘Catalogue Entry: Dorothea Tanning, A Mi-Voix 1958’, Tate, 2010/2012, http://www.tate.org.uk/art/artworks/tanning-a-mi-voix-t00298, accessed 24 January 2017). Tanning’s abstraction of the late 1950s can be seen in works such as A Mi-Voix and Insomnias 1957 (Moderna Museet, Stockholm), in which the artist blended paint and blurred edges, resulting in indistinct shapes on multiple, complex planes which merge with their background. Writing in her autobiography, which was first published in 1989, Tanning described this way of working as a means to ‘lead the eye into spaces that hid, revealed, transformed all at once and where there would be some never-before-seen image, as if it had appeared with no help from me’ (Tanning 2001, pp.213–14). Her suggestion that the image revealed itself to her as she worked is reminiscent of the surrealist technique of automatic drawing from which artists attempted to produce images informed by the subconscious. In 1959 Tanning produced two further paintings on the theme of whispers that are titled with the Italian translation of the word (Sotto Voce, both in private collections). One of the works is black and white and the other introduces colour, and both are suggestive of the effects of synaesthesia – the stimulation of one sense through another, in this instance that of sound through vision. In 1969 Tanning wrote of her art being inspired by sound and her desire to capture this, citing an experience at a concert in Paris when the music inspired her to make soft sculptures: ‘Spinning among the unearthly sounds of Hymnen were the earthly, even organic shapes that I would make, had to make’ (Tanning 2001, pp.281–2). Carlo McCormick, ‘Dorothea Tanning’, BOMB, no.33, Autumn 1990, http://bombmagazine.org/article/1353/dorothea-tanning, accessed 24 January 2017. Jean Christophe Bailly and Robert C. Morgan, Dorothea Tanning, New York 1996. Dorothea Tanning, Between Lives: An Artist and Her World, New York 2001. Purchased from the artist by William N. Copley in 1959 and presented to the Tate Gallery in the same year. Dorothea Tanning, Galerie Edouard Loeb, Societé d’Art Saint-Germain des Près and Galerie Mouradian Vallotton, Paris, 26 May–13 June 1959. Dorothea Tanning, XXe Festival Belge d’Été, Casino Communal, Brussels, June–August 1967 no.40 (as Sotto Voce). Surrealism: The Untamed Eye, Norwich, Castle Museum, July–November 1999, catalogue no. 34, reproduced in colour, p.38. Constantin Jelenski, ‘Dorothea Tanning’, Preuves, June 1959, p.92. Jean Christophe Bailly, Dorothea Tanning, New York 1995, p.145, pl.119. Victoria Carruthers, ‘Between Sound and Silence: Exploring some Connections between John Cage, Karlheinz Stockhausen and the Sculptures of Dorothea Tanning’, in Patrizia di Bello and Gabriel Koureas (eds. ), Art, History and the Senses: 1830 to the Present, Aldershot 2010. Victoria Carruthers, ‘Dorothea Tanning and Her Gothic Imagination’, Journal of Surrealism and the Americas, vol.5, no.1, 2011, pp.134–58. A Mi-Voix in one of many works by Tanning that emerged from a period of experimentation with abstraction beginning in the mid-1950s. Previously, her work had utilised the conventions of surrealism, in which supernatural and highly fantastical images were rendered in a meticulously realistic style. Eine Kleine Nachtmusik 1943 (Tate T07346) and Some Roses and their Phantoms 1952 (Tate T07987) exemplify work from that period. Although never abandoning figuration, by 1955 the artist’s formal and stylistic interest had turned decisively towards the freer and more fluid expression available through abstraction. This sea-change coincided with two shifts: a move away from America to France, where Tanning and her husband, the surrealist artist Max Ernst (1891–1976), remained for many years, and the artist’s desire to produce images that reflected the emergence of new aesthetic and social concerns in a more psychologically anxious, post-war America and Europe. An interest in the quality of the painted medium itself and an attempt to create a direct, emotional response in the viewer characterise Tanning’s work of this period. In A Mi-Voix, three figures are seated around a small café-style table. Each is just discernible by a smudged black outline but none of the faces can be distinguished. The figures to right and left of centre are painted in varying hues of white and appear brightly lit, whereas the middle figure is depicted in blacks and greys, creating a dark central focus. Apart from the oval surface of the table, there is no suggestion of a setting and the figures float freely against a smoky background of similar colours which threatens to absorb their hazy forms. Around each distorted figure are ambiguous shapes and outlines which give the impression of movement. Only an eye and a mouth set with sparkling white teeth are clearly recognisable in the composition, exuding a slight sense of menace. 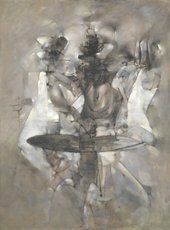 In other paintings from this period, such as Insomnias 1957 (Collection of the artist), Tanning conjures a sense of anxiety and agitation by engulfing her figures in clouds of smoke and light that threaten to subsume and obliterate them completely. In paintings such as Le Mal Oublié 1955 (The Ill Forgotten; Collection of the artist) and Tempête en jaune 1956 (Tempest in Yellow; Collection of the artist), the effect is of looking through a rain-streaked pane of glass at an ill-defined world of dissolving colour and prisms of blinding light. The use of yellow and daubs of blood red in these works suggests a visceral intensity and undercurrent of violence. When asked to comment on the theme of A Mi-Voix, Tanning responded in a letter to the Tate Gallery dated 15 January 1960 that the purpose of the work was to ‘paint a white and gray picture that would still have color [sic] in its veins as we have blood under our winter-white skin. And lots of unexpected light sources’.1 Thus, in common with many other artists of the period, Tanning was using paint as a metaphor for the flesh and blood of the human body. Later, with sculptures such as Nue Couchée 1969–70 (Tate T07989), she would experiment with different fabrics to suggest both the fragility and the strength of human skin, using table tennis balls to indicate the spinal vertebrae pushing through the flesh. The title A Mi-Voix can be translated as ‘Whispers’ or ‘In a Half Whisper’. References to music and vocal sounds proliferate in Tanning’s titles and subject matter throughout her career: Eine Kleine Nachtmusik (A Little Night Music, Tate T07346), Tango 1939 (Collection of the artist), Musical Chairs 1951 (Private Collection) and Tango Lives 1975 (Moderna Museet, Stockholm) are a few examples. A Mi-Voix was also known as ‘Sotto Voce’, the Italian translation of the title. In 1959 Tanning painted Sotto Voce II (Private Collection), a reworking of the scene, but with two figures instead of three. Both paintings were exhibited together with these titles in 1967 at the Casino Communal in Brussels during the Twentieth Belgian Summer Festival (XXe Festival Belge d’Eté). Music was clearly an important source of inspiration for Tanning, who recounted how a concert of Karlheinz Stockhausen’s Hymnen IV would prove the catalyst for her soft sculptures (see Nue couchée, Tate T07989).2 Tanning’s very close relationship with the composer John Cage (1912–1992) and numerous collaborations with the choreographer Merce Cunningham (1919–2009), also influenced her interest in exploring themes of sound and voice as expressions of primal, subconscious impulses. Commenting on A Mi-Voix much later in November 2005, Tanning spoke of an incident in her past when she had been fascinated by the accumulated effect of a number of whispered conversations in the confined space of a café: ‘There was a lot of noise but it was like [white] sound. I could only discern a few, rather nasty, words here and there. The hiss of whispers became malicious.’3 In the context of this statement, the fragmented eye and apparently smiling teeth become symbolic of the potentially destructive power of whispered speculation, hearsay and gossip. Supported by The AHRC Research Centre for the Study of Surrealism and its Legacies. 2 The story is told in Tanning’s memoir Between Lives, New York 2001, pp.281–2. 3 Conversation with the author, November 2005.